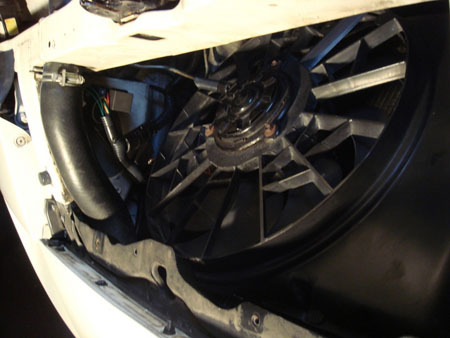 There are many reasons to install an electrically powered fan over the stock Clutch fan. One of the most common reasons is to remove some parasitic drag on the motor. This in turn will free some horsepower. 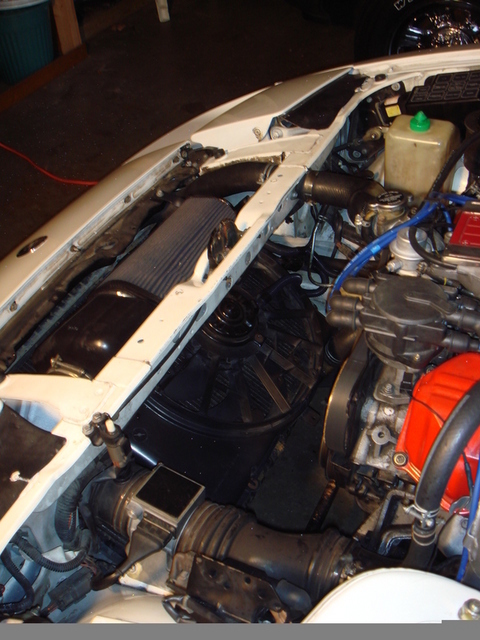 Here is a little write-up on how to install the Taurus fan into a z31 written by Z31 performance forum member Mike_GruiZinga. It covers the install, and how make use of both its speeds with an automatic control module. Note: 89-94 Maxima fans also will work but wiring and mounting may be a little different. Remove the upper fan shroud by removing 1 10mm bolt up top and 4 clips underneath. Remove your old mechanical fan assembly by removing the 4 10mm nuts which retain it to the water pump pulley. Be careful not to remove the pulley. The pulley is held on by the same nuts. If the pulley comes off you will need to loosen the fan belt to get it back together. Put the nuts back on and tighten them. Remove air intake from MAF sensor forwards. 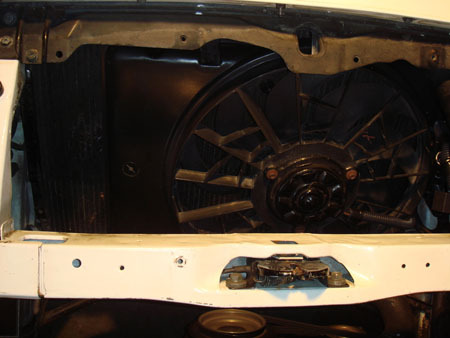 Remove lower fan shroud by first removing 2 lower 10mm bolts, then either cutting or breaking the shroud in half so you can pull it out from the top. You can also remove the nose piece and radiator and pull the shroud out in one piece if you would like. Now take your Taurus fan and set it down onto the radiator. You should notice that if you line it up on the left side of the radiator (like I did) one bolt hole from the E-fan shroud lines up with one of the lower shroud mounting holes. For my Taurus fan I had to slot the hole in the shroud a little for it to line up perfectly. 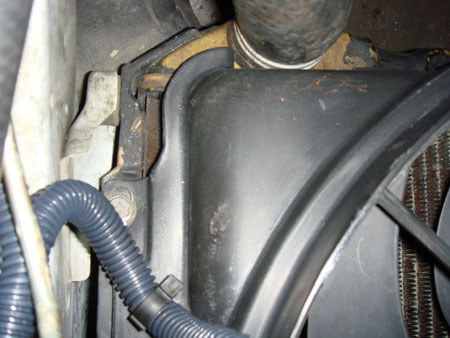 However the bottom of the fan shroud was rubbing on the lower radiator hose. To fix this, I ground off some of the plastic so that proper clearance was achieved. Next, bolt the fan down using the one existing hole. The relay has five terminals labeled: common (C), normally open (NO), normally closed (NC) and two for the relay coil, ground and +12vdc. The Taurus fan has three wires coming out of it. Different year fans have different color wires, so you should test your fan with a battery or check with someone down at the Ford dealership. My fan had these wires: One black ground wire, one blue high speed wire, and one orange/black low speed wire. The Hayden fan controller is easy to install. Follow the instructions for hooking up the wire for power, ground, ignition source, temperature probe, and A/C switch (if you have A/C). You should now be left with two wires. These are the wires that send power out to your fan. Connect the wire for fan #1 to the C terminal on the relay. Connect the wire for fan #2 to the +12vdc terminal on the relay. Connect the low speed wire to the NC terminal on the relay. Connect the high speed wire to the NO terminal on the relay. Connect your grounds from the fan, the relay, and the controller to a clean spot on the chassis. When the temperature reaches an adjustable set point, say 170 degrees, the controller energizes the fan #1 wire and power goes through the relay to the low speed wire on the Taurus fan. When the temperature reaches a certain temp above your set point the controller energizes both fan #1 and fan #2 wires which energizes the relay causing it to switch the power from the low speed to the high. Connected this way the fan can never get power to both the high and low speeds at the same time which could burn out the motor. The Hayden unit comes with a 25 amp inline fuse. Replace the 25 amp fuse with a 40 amp fuse and call it a day. Here is a Diagram of a similar setup. I wired in a under hood switch in my setup as well. This is optional, but I thought it would be good to be able to pop the hood and turn on the fan at the drag strip, or just in case I started to overheat. It's really simple. The fan controller has a green wire that can be wired to the A/C compressor so that the fan switches on when A/C is on. Since I removed my A/C, I used a switch to control power to the green wire. Connect the green wire from the fan controller to your switch, and connect an ignition powered wire (preferably the same one you wired the controller to) to the other terminal of the switch. After wiring the fan in this matter, I read about another method for running a two-speed or dual fan. Wire in the low speed to a relay and temp probe. The wire in the second speed (or second fan) to the AC condenser fans plug. The condenser fan is set (from the factory) to come on at water temps above 212F. Therefore, it would be possible to wire it in such a way that the fan was on low at the controllers set temperature, and then kicked to high when the water temperature reached 212F. Next time I wire up a fan, I will most likely try this method. I tested my fan and it drew 21 amps on low, and 35 amps on high. When the fan kicked on I noticed no difference in idle speed but my stock voltmeter did momentarily fall 1 volt and then rise back up. If I manually switched the fan onto high speed (it wasn't hot enough to get the controller to switch it to high speed on its own) the engine RPM's dropped about 100 and then came back up. It was similar to switching on the A/C at idle in a stock Z31. With all that amperage draw, make sure your alternator is up to the challenge. My car has no amp-drawing A/C or stereo systems and my alternator is fairly new. It seems to be doing just fine with the fan installed. I will eventually probably end up upgrading to a maxima (90amp) alternator when I start needing some more current. My Taurus fan is not silent. I assume this is from old age and sitting in a junkyard. I think that with some electric motor cleaner (I found some at a local R/C hobby shop) and some WD-40 I should be able to make it whisper quiet. It's not any louder than the stock dual fans on my 94 Mazda 626, but you can hear it when it comes on. High speed is quite a bit louder than low speed. These things move a lot of air. I have read that on high, the Taurus fans flow more than 3300cfm. When mine came on for the first time (on high) the fan literally swept the floor under the radiator. Dust and radiator debris flew into my engine bay. Anyways, that's all there is to it, besides a little engine bay cleanup I need to take care of. These fans are easy to find and easy to install. It's automatic and fairly cheap. I installed mine for under $90. It can be done cheaper, but I didn't have any wiring or connectors, and I wanted an under hood switch. It fits well and makes some space in the engine bay. It's quieter than the stock fan, and when it is off, it saves you a few HP and maybe even gets you better fuel economy.